Home » Health » What Is Supraventricular Tachycardia? Supraventricular Tachycardia or SVT is a type of heart rhythm disorder, in which the heart beats faster than normal, which originates from electrical impulses in the heart chambers or atria ( chambers above the heart chambers or ventricles ), the AV nodes. The condition of SVT occurs when electrical impulses that regulate heart rate do not work normally. As a result, the heart beats so fast that the heart muscle cannot relax between contractions. 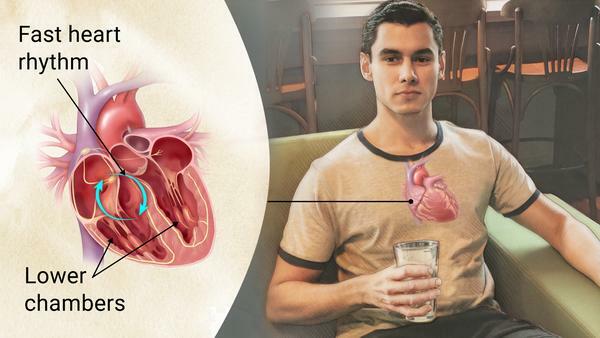 If this condition occurs, the heart's ventricles cannot contract strongly so they cannot meet the blood supply needs of the body, including the brain. This condition can make sufferers feel dizzy or faint. Supraventricular tachycardia can be experienced by all ages. Most sufferers only experience occasional SVT, and can live normally. But this condition can cause problems when the symptoms persist, especially in patients who have had problems with the heart. Symptoms often begin and end suddenly. Occurs several times every day or once a year. Lasts for several minutes, although sometimes it can last up to several hours. Can occur at any age. Most sufferers experience symptoms of SVT at around 25 to 40 years of age. The pulse in the neck feels throbbing. SVT's heart rate can reach 140 to 250 times per minute, very high compared to a normal heart rate of 60-100 times per minute. Symptoms in SVT sufferers with pre-existing heart disease will feel more uncomfortable than patients without heart problems. While in some patients, SVT has no symptoms at all. Heart rate exceeds 200 times per minute. Supraventricular tachycardia (SVT) occurs when the electrical system that regulates the heart's rhythm in the body is disrupted. The heart rhythm is regulated by a natural pacemaker (sinus node) in the right atrium of the part. The node produces electrical impulses that start each heartbeat. From the sinus node, the impulse passes through the atrium which causes the atrial muscle to contract, thus pumping blood to the heart ventricle. Furthermore, the node arrives at a cell group called the atrioventricular (AV) node which is a single pathway of electrical signals from the atrium to the ventricles. This AV node slows electrical signals to the ventricles, so that the full ventricle fills with blood before contracting and pumping blood to the lungs or the whole body, due to the electrical signal. When there is a disruption in the AV node, the heart beats very fast, so that the heart does not have time to fill with blood before contracting again. As a result, other organs, such as the brain, do not receive adequate blood or oxygen supply. Atrioventricular nodal reentrant tachycardia (AVNRT). This type can occur at any age, but is more experienced by young women. In this condition, the cell near the AV node does not transmit electrical signals correctly, but instead creates a circular signal that causes additional beats. Atrioventricular reciprocating tachycardia (AVRT). This type is most commonly found in adolescents. Usually, a signal sent by the sinus node will end after passing through all the space in the heart. But in AVRT, the signal plays back to the AV node after passing through the ventricles causing an additional beat. Atrial tachycardia. In this condition, in addition to the sinus node, there are other nodes that send electrical impulses causing additional beats. This condition is generally experienced by people with heart or lung disease. Have heart disease or after undergoing heart surgery. Heart disease can be in the form of coronary heart disease, heart valve disease, cardiomyopathy , and congenital heart disease. Suffer from other medical conditions, such as thyroid hormone disorders, diabetes, and sleep apnea . Babies, children, and women (especially pregnant women). Take drugs and supplements. Several types of drugs and supplements can trigger SVT, including: digoxin for heart failure, theophylline for asthma, and decongestant and hypo- allergenic drugs for colds ( ephedrine, pesudophedrine, phenylephrine ). Consume too much caffeine or alcohol. Electrocardiography , to see the electrical activity of the heart. Echocardiography, to display the size, structure, and movement of the heart. Holter monitoring , used for a full day to record the heart's electrical activity during routine activities. Implantable loop recorder, is a device that is placed under the skin in the chest area, to detect abnormal heart rhythms. Stress test . In this test, the patient is asked to exercise on a static bicycle or treadmill to see the electrical activity of the heart when given pressure. Electrophysiological testing and mapping. In this test, the doctor inserts a catheter containing electrodes in the heart's blood vessels. Once placed, the electrode can map the spread of electrical impulses throughout the heart. Tilt table test. This test is carried out for SVT patients who have fainted. In this test, the patient is asked to lie on a table, then measure his blood pressure and heart rate. After that, the table will be tilted until the patient stands to see the heart and nervous system's response to the change in position. Heart rate . This test is performed if the pressure test shows abnormal results, while the sufferer experiences chest pain, shortness of breath, or fainting. This catheterization is carried out under local anesthesia to identify problems in the heart valves or coronary arteries. In addition to a series of tests to find out the cause of SVT, a blood and urine test also needs to be done. Blood tests are performed to determine the possibility of thyroid disease or damage to the heart muscle, while urine tests can identify whether SVT is caused by drugs. Cold water technique. Put your face into a bowl of dry water and ice, and hold your breath for a few seconds. Valsalva maneuver. Hold your breath, shut your mouth tight, close your nose tightly, and do the blowing blow as hard as you can. These movements affect the nervous system that controls the heartbeat, so the heart rate can be slower. Giving a heart rhythm regulating drug, to control SVT until the heart rate returns to normal. Consumption of this drug should be in accordance with the doctor's recommendations to minimize side effects. This method gives an electric shock effect to the heart which can affect the electrical impulses in the heart so that the heart rate returns to normal. Ablation through cardiac catheterization. In this procedure, electrodes on the catheter are inserted through the heart's blood vessels. These electrodes with radio waves can damage or widen the heart tissue, and make electrical blocks along the electrical lines that cause SVT. Installation of a pacemaker. This tool is installed under the skin near the neck bone, to emit electrical impulses to stimulate the heart rate to return to normal. For patients with tachycardia caused by other conditions, such as coronary heart disease, hyperthyroidism , or lung disease, the condition needs to be addressed before SVT is treated. Complications can occur if recurrent supraventricular tachycardia is not treated thoroughly. Among them are decreased consciousness , an increasingly weak heart, to heart failure. Reducing consumption of caffeine or alcohol. Be careful when taking drugs that can trigger heart rate acceleration. For example, over-the-counter drugs for coughing cold can trigger heart rate acceleration. In addition, cocaine or methamphetamine abuse can also cause SVT. Maintaining an ideal body weight . 0 Response to "What Is Supraventricular Tachycardia?"